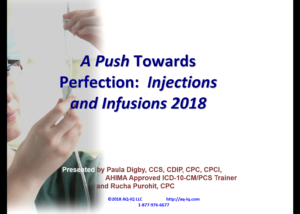 The goal of this presentation is to help you understand injections and infusions: the guidelines, the definitions, whether or not physician involvement is required, code selection based on the time the services were actually provided, and documentation and billing requirements. Injections and infusions can be difficult to code properly, and in our reviews across the country, are a common problem area in many settings. To ensure accuracy and prevent revenue loss, we recommend this course to learn the requirements and become a pro even in this hard-to-perfect area. This course authored by Paula Digby and Rucha Purohit.